1. 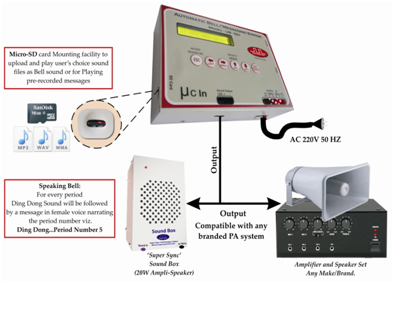 MICRO-SD CARD MOUNTING FACILITY: User’s choice sound files can be uploaded and played as Bell sound or as pre-recorded message at user programmable time schedule. 2. SOUND FILE FORMAT : Sound files can be of Mp3, WAV or WMA format. 3. PRE-LOADED SOUND: Micro-SD card will come with pre-loaded sound files in female voice narrating “Period No. 1, Period No. 2, Lunch Time” and like wise. 4. 7 DAYS PROGRAMMING: Every day of the week can be programmed with different schedule i.e. Monday can have different schedule than Tuesday or Saturday or any other day of the week. 5. NO OF SCHEDULES: 24 different Time table schedules can be programmed in this model. Out of these 24 Schedules any schedule can be selected to ring on any weekday. These 24 Schedules will include user’s Half Day schedule, sessional/term tests schedule, exam schedule, winter/summer schedule, annual day / sports week schedule etc. 6. NUMBER OF BELLS PER SCHEDULES: 50 Bells can be programmed in each schedule to ring in 24 Hours. 7. CALENDAR HOLIDAYS: 10 holidays can be programmed in each month i.e. 120 holidays in a year. 8. MONTHLY HOLIDAY: Any fix date, second Saturday or last working day of month can also be programmed as holidays. 9. WEEKLY HOLIDAY: : Multiple days can be programmed as weekly holiday i.e. weekly holidays can be 1 day or 2 day or all 7 days of week. 10. 3 MODES: There are three different modes named as Summer Mode, Winter Mode and Exam Mode. This facilitates user to pre-store 3 different set of schedules for 7 days of week to cover whole year's time table. 11. OUTPUT ATTACHMENTS: “SuperSync” Sound Box (Ampli-Speaker) or any branded Amplifier and Speaker System (PA System) can be connected with this model. 12. INPUT SUPPLY: 220V 50Hz AC Supply. A. Amplifier Supply Output : 220V 50Hz | 08 Ampere | For auto ON-OFF of Amplifier’s power Supply at bell time. B. Sound Output : This output needs to be connected on AUX In terminal of Amplifier or at Sound Input Terminal of “SuperSync” Sound Box. USE FULL: System fully relieves the person responsible to ring bell at accurate time. It is fully automatic. 1. DISPLAY: 32 Character digital display to show Current date, time in first, row and next bell Time in 2nd row. 2. STAND ALONE machine, no computers Required to program or maintain Ringing schedule. APNB model system rings bell once for period No.01, Twice for period No.02 and so on. For assemble, interval and school off single shot Long Bell of 10 Sec will ring and for short break, zero period etc a Short bell of 05 Sec will ring. APB Model bell rings single shot once only. User can set the ringing duration between 01 to 99 seconds. 6. MODES: 05 Modes of operation (summer, winter, Unit Test, Examination and Spare mode) to cover all seasons of year and special events like sports, examination, annual functions etc. 30 bells per day can be programmed in each mode. This is enough for two shift schools round the clock throughout the year. 8. MONTHLY OFF: any date of month can be selected as monthly off. 9. HALF DAY: : Any day of week or any date of month can be made half day. 30 Bell can be programmed. 11. CONNECT MORE NUMBER OF BELLS ON SINGLE CONTROL UNIT: to bring all areas of school in audible range. With one electronic bell 70 to 100 Meter area is covered. 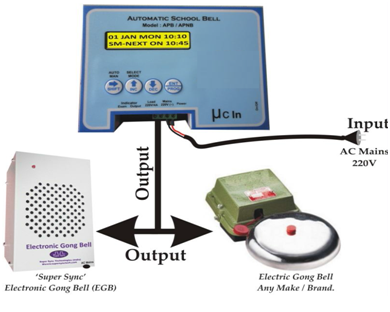 Up to 10 electronic gong bells can be connected directly on control unit. All of them will ring simultaneously.